January 2, 2019 – Los Angeles-based producer, Scott Browning, has chosen three young women from McKinney as paid interns for the new TV series A Night of Artists and Chefs. Ally Tauber and Karsyn Gorman, both juniors at McKinney High School, and Jordan Gros, a home schooled senior, will be capturing footage of McKinney through their eyes to be included in the production. 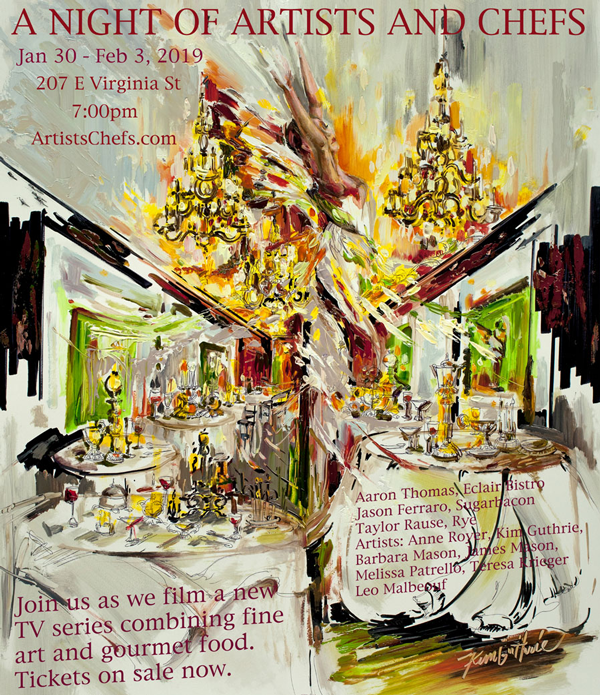 Focusing on smaller communities across the U.S. with vibrant art and food scenes, A Night of Artists and Chefs brings together local artists to transform an event space into an “art cocoon” and local chefs to create a sumptuous meal with paired wines that complement the room. The local chefs chosen to participate are Aaron Thomas of Éclair Bistro, Jason Ferraro of Sugarbacon/Butcherboard, and Taylor Rause of Rye. The team of local artists who will transform Gather in Downtown McKinney is being led by Anne Royer, founder of the COVE arts cooperative. Her team includes Kim Guthrie, Melissa Patrello, Barbara Mason, James Mason, Teresa Krieger and Leo Malboeuf. The event will run for five nights from January 30, 2019 through February 3, 2019 from 7:00-10:00 p.m. at Gather, 207 E Virginia Street. Camera crews that include the interns will be capturing the event on video and asking guests for opinions and impressions. Tickets are on sale now at www.ArtistsChefs.com. Early bird discounts are available while supplies last. Regular ticket $10 off (enter discount code early10 at check-out). Premium ticket $25 off (enter discount code early25 at check-out).